Home offices are becoming more common than ever before. Today, they are used not only for managing the household, but many folks are able to telecommute and work from home at least several days per week. Having a desk that fits not only the room, but also the functions required by the user, is an important part of designing a useful home office. Today’s guest post, contributed by Nikhil Satsangi, will give you an overview of the basic desk designs and how they can work for you. The comfort of working at home has become the norm these days and now more and more people are trying figure out how to better design their workplaces. Sitting on your living room sofa is probably something you want to avoid because let’s face it – you would leave a paper trail all over the living room floor. That is why investing in a desk is the best path to take. Making desk space in your home is the first step and surprisingly the easiest. Picking out the right desk is a different dilemma. A corner desk is a good fit for you if you have limited space for anything bigger. The best part about a corner desk is is that, unless your room is a complete circle, a corner desk can almost always fit in it. Corner desks are commonly used in kid’s rooms for homework and social media purposes or in an area where everyone can use the home computer. Using a corner desk when working from home can be a bit problematic because of the limited space for a desktop and the fact that you have to face a corner the entire time, and that’s no fun. L-shaped desks are commonly found in offices, especially in the cubicles and have a lot more desk space than the corner desk. These desks make more sense when working from home;it’s just a matter of find enough space to fit them. They essentially have two areas for you to place your papers and your desktop which is pretty convenient. Again, the only issue with this desk is finding space for it and the amount of unused space behind the desktop. Because of the unused space, the room is not used to the fullest. 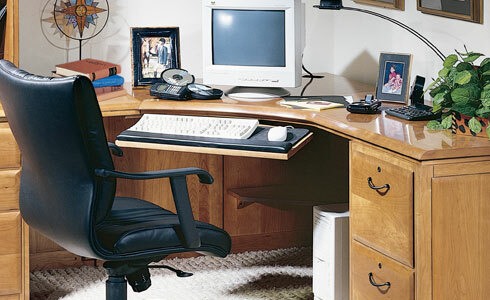 Like the L-shaped desk, the U-shaped desk has a lot of desktop space. It is much like the L-shaped desk, but has an extra arm to make it wrap around the user on 3 sides. This is great for people who use to different desktops for work and need the space for it. U-shaped desks can accommodate for a lot of your work related materials, but room to maneuver is limited. A big issue with U-shaped desks is that if it is designed for one room. That means it probably won’t fit in any other room in the house if you had to move it. These types of desks are a little bigger than corner desks, but offer more desktop space and plenty of screen privacy, as well. 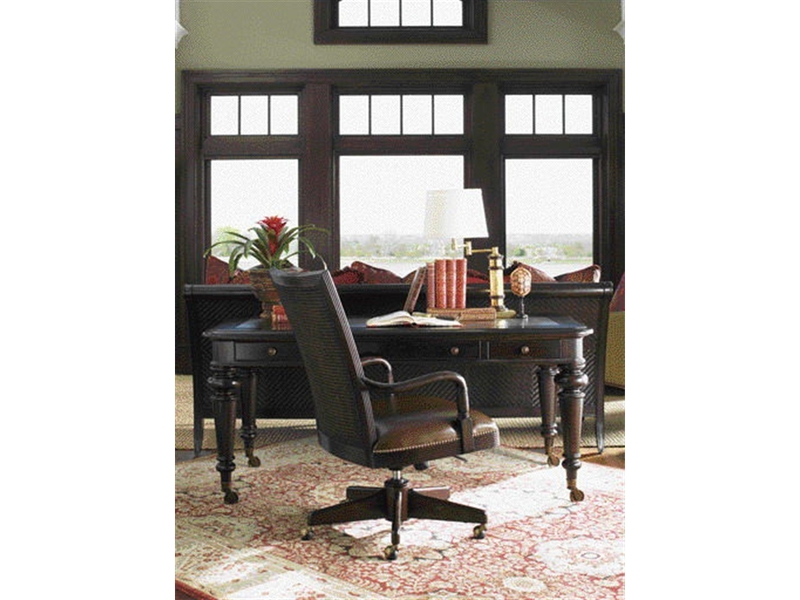 Center desks are pretty popular for home offices because of the space you have to maneuver around the room and stretch your legs. You can also utilize more of your office space because of the little space they take up. One thing that is very aggravating when having this type of desk is handling all the wires coming from your computer and desktop. Having outlets on the floor can help with this problem. Last, but not least, we have the double-bar (or executive) desk. You could say this is the mac-daddy of all desks because it is basically two different desks, a credenza that sits against the wall and a double-pedestal desk that is closer to the center of the room. 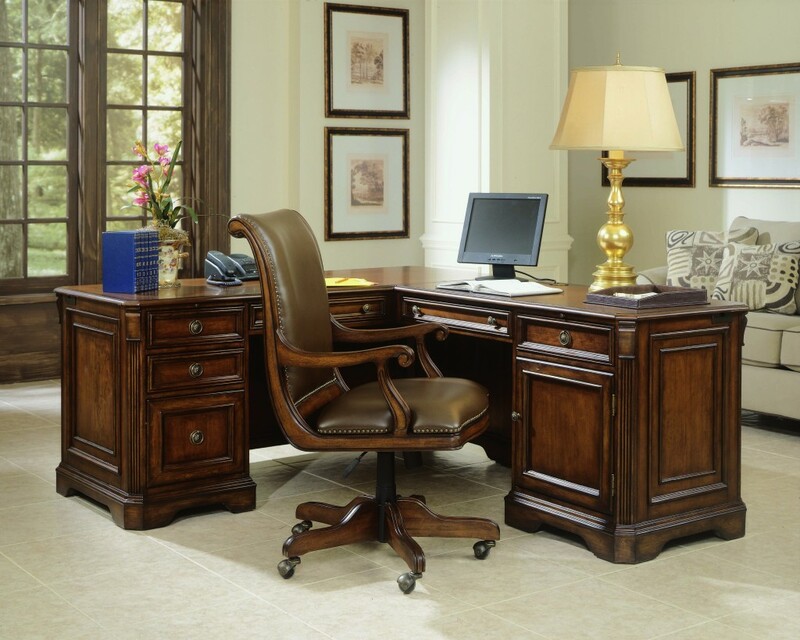 It gives you more of an executive office look and gives you more desk space than any other desk we have mentioned. With all the storage space you could ask for, this is the ultimate work space. Because of its size, you would have to make a lot of room for it, but don’t you think it is worth feeling like the boss? This article was written by Nikhil Satsangi on behalf of Good’s Home Furnishings.